These toddler friendly farm-stays are small holiday complexes of cottages and/or log cabins or yurts and tipis often run by families themselves. They have animals onsite to look after and animal lovers will really enjoy getting their hands dirty down on the farm. Many of the property owners who own farm-stays arrange daily animal feed runs, quite often in a tractor and lots of animal petting, riding and egg collecting. Family friendly fun near St Austell with shared indoor pool, farm animals and indoor/outdoor play areas. This child-friendly farm stay is just 10 minute stroll from the local village and 10 mins to beaches by car. One of three holiday farm cottages winning Carmarthenshire Accommodation of the year award. An authentic farm stay with something for all the family. This luxury eco-friendly farm stay in Cornwall has everything you could possibly want on a family holiday, perfect for children and adults of all ages. There are 15 holiday homes at Treworgey Cottages, all of various sizes and guests have full use of the amazing facilities within the 150 acres including play barn, animal feeding, swimming pool, soft play, pony rides etc. Adults will love it here, with all-weather tennis, hot tub, babysitting and more, oh and dogs and ponies are welcome too. Catering available for special family celebrations. A spacious and modern detached single story barn conversion, with open plan living, ideal for those wanting plenty of space, walk to beach. The ideal property for a large family or group of friends. Great socialising space and close to beaches with indoor pool and play barn. Fun for the whole family! A holiday cottage on a mini working farm in a great location for Padstow and sandy beaches with fabulous facilities for babies, toddlers and older children. A collection of three-bedroom family-friendly holiday cottages at Treworgey with stunning views, private garden and lots of facilities within the 150 acres. Children will enjoy feeding the animals, playing in the pool, exploring the grounds, making dens or playing in one of the indoor or outdoor play areas, tennis and more. A lovely child-friendly cottage on the grounds of a working farm with stunning views and private court yard. The ideal base for exploring the Lakes with your little ones. 1 of 6 child-friendly holiday cottages with its own private terrace at family-friendly Chateau de Gurat. Explore the Charente and Dordogne regions or just relax in the chateau's grounds by the enclosed heated swimming pools while the kids play in the extensive gardens and play barn. Family-friendly character barn conversion and within the grounds young children will love the experiences of donkey grooming & other animals, walk to beach too! Children will love to meet the farmyard friends at Nettlecombe Farm. They can help Farmer John collect eggs and feed the lambs and other animals. The Isle of Wight has so much to offer families and this is a perfect base for a family holiday to explore from. 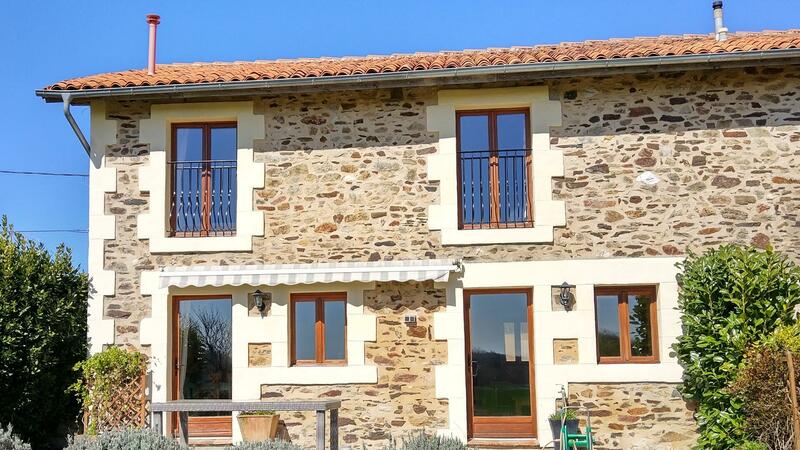 A pretty holiday cottage 10 minutes from Brittany's Southern coastline and sandy beaches. Private enclosed garden with views over the fields. This wonderful holiday home is perfect for a rural escape yet close to everything that Brittany has to offer families. Plus you can walk to the owners restaurant! This converted farmhouse property is all on one level with outside courtyard overlooking the beautiful valley. It is the perfect base for exploring the farm and all that the Isle of Wight has to offer for your next family holiday. Lovely stone built cottage facing a courtyard located in an area of Outstanding Natural Beauty close to the Exmoor National park. This log cabin is situated in 30 acres of land and part of a small hamlet of cottages, lodges and cabins between Bodmin Moor and the beaches of north Cornwall. This collection of ten baby and toddler-friendly holiday cottages are nestled in the Suffolk countryside less than two hours from central London. Awarded a Gold award by the tourist board they are ideal for a group holiday celebration. The farmhouse has six bedrooms plus a further four bedrooms in the attached annex, and each of the cottages range from 1 to 4 bedrooms, so any configuration is possible. There is an indoor swimming pool, play barn, tennis court and lovely animals to feed. This is a fab luxury farm-stay for all the family to enjoy and perfect for that special birthday celebration or event. There is also an onsite spa centre offering a variety of treatments. This two bed holiday cottage near St Ives in Cornwall is ideal for a family holiday in Cornwall with young children. It sits in an area of outstanding natural beauty on a working farm with stunning views and close to lots of family-friendly beaches and days out. With plenty of livestock to meet and a plethora of child friendly activities there is enough to keep the most energetic little ones happy on this delightful farm on the Isle of Wight. Nettlecombe Farm is also in a great location to visit family-friendly attractions and close to beaches too. Charming child-friendly holiday cottage in north Cornwall (near Bude) offering a farm-stay style break for families looking for a quiet getaway – this cottage has a private enclosed garden and is pet friendly too. Trevorrick is a wonderful farm stay ideal for a family holiday with 4 star holiday cottages and heated indoor pool, animals and lots of play equipment and toys. This lovely four star cottage has its own private garden and shares the beautiful valley with five other holiday homes. Just 700 metres from the fun pebbled beach with rock pools this child friendly holiday homes is the perfect location for a family holiday in Normandy. This gite has enclosed walled gardens, play barn and play room. Perfect for those under 5's! The owners also have animals to pet too. A fun and characterful family holiday cottage in Brittany full of charm with two comfortable bedrooms and a private garden. Walking distance to village, 10 to 15 mins drive to beaches. This charming toddler-friendly holiday home in the Lot region in South West France and was designed with children and toddlers in mind. It has a private enclosed terrace and shares its lovely grounds with one other cottage. Both of which have full access to the facilities within the grounds including and enclosed heated swimming pool, play barn and animal petting. This amazing super child-friendly glamping dome is perfect if you love the idea of camping but would prefer a few more luxuries! An amazing holiday experience in the beautiful South West of France that the whole family will enjoy. A beautiful cottage close to St Austell with great facilities for the whole family, walk to village and glorious beaches only a 10 minute drive away. A large detached child-friendly holiday cottage ideal for a group holiday with family or friends in Brittany. Private plunge pool & garden plus full use of shared facilities within the grounds including: fully enclosed swimming pool, gardens, children's play equipment and animals to pet. This cottage is set in a converted, medieval Tudor barn with wooden beams and original architecture. With indoor swimming pool, play barn and animals to pet it is a great place for families with kids. Geoff's Barn is a luxury four-bedroom family-friendly holiday cottage with private enclose garden in the lovely farm-stay Treworgey Cottages, Cornwall. Guests here have access to all the facilities within the 150 acres farm-stay including animal feeding, spa treatments, indoor and outdoor play areas, swimming pools, home-cooked meals and more. Converted farmhouse property, boasting stunning views of the lakes and countryside, where children will love the working farm, collecting eggs and feeding the lambs. Nettlecombe Farm was voted as one of the best family-friendly farm stays by the Guardian and Telegraph. This child-friendly holiday cottage is located at Trevorrick Farm in Cornwall close to sandy beaches, Padstow and has great facilities for the kids. Splash in the indoor pool, feed the animals play in the gardens. This beautifully renovated converted barn is located in a valley with acres of grounds to wander. Five star Georgian holiday house is located in a secluded wooded valley in an area of outstanding beauty close to the North Devon Coast. This lovely farm stay is located just two miles from St Ives Harbour, there are a total of four holiday cottages, three of which are child-friendly, offering a brilliant base for a fun family holiday in Cornwall. With lots of play equipment, and toys for all ages and animals within the farm plus beautiful scenery and fab family days out nearby, its location speaks for itself. Child-friendly holiday cottage in Suffolk, ideal for a larger family or group of friends. It has a private fenced garden with a hot tub & Wendy House so you can enjoy the beautiful surroundings and access to all the facilities on-site including indoor swimming pool. This historic converted cottage, oozing charm is two miles from the hamlet of Cardinham in North Cornwall and offers a stunning and tranquil base for a family holiday. This former granary barn is now one of nine luxury cottages situated on this very beautiful child-friendly holiday farm on the Isle of Wight. Nettlecombe Farm is home to lots of animals that the children can help feed and look after and close to family-friendly attractions and seaside towns. This toddler friendly farm-stay is the perfect base for exploring North Cornwall, Padstow is in walking distance and the sandy beaches are close by too. The little ones will love a holiday at Trevorrick Farm, animals to pet, games to play and and indoor swimming pool too. This child-friendly cottage has views facing out over the rolling country side and is set with a farm. This converted milk parlour, with large dining area and enclosed private garden, is nestled amongst the lakes and a working farm. Vot and perfect for large group holiday. ed as one of the best family friendly farm stays by both the Guardian and Telegraph, Nettlecombe Farm is a great place to take the kids on holiday in the Isle of Wight, close to beaches and attractions. This superb holiday cottage, set amongst the rolling countryside and lakes of the Isle of Wight, has four play areas and farmyard friends to make sure your children are never short of things to do. A lovely child friendly holiday cottage on this Cornish farm, a great opportunity for the kids to get close to the animals. Indoor pool and perfect location for North Cornwall’s beaches too. If you're looking for an animal fun filled family holiday in Cornwall Trevorrick Farm won't dissapoint. One of eight beautiful family-friendly holiday cottages tastefully converted and enjoying views overlooking the Glyn Valley in North Cornwall. This luxury holiday cottage, ideal for babies toddlers and older children, is one of nine traditional Isle of Wight farm buildings converted to a high standard on Nettlecombe Farm. It is a great location for a family holiday and only 3 miles from the seaside! One of three 4 star Visit Wales rated child-friendly holiday cottages on a small working farm. Enjoy the interactive farm activities for the whole family and soak up the stunning countryside. This child-friendly holiday cottage has won awards for best self-catering accommodation in Carmarthenshire, a great base for your family holiday in Wales. A collection of two bedroom toddler-friendly holiday cottages on this award winning farm-stay in Cornwall. Treworgey Cottages offer stunning views, private gardens and lots of facilities within the 150 acres.